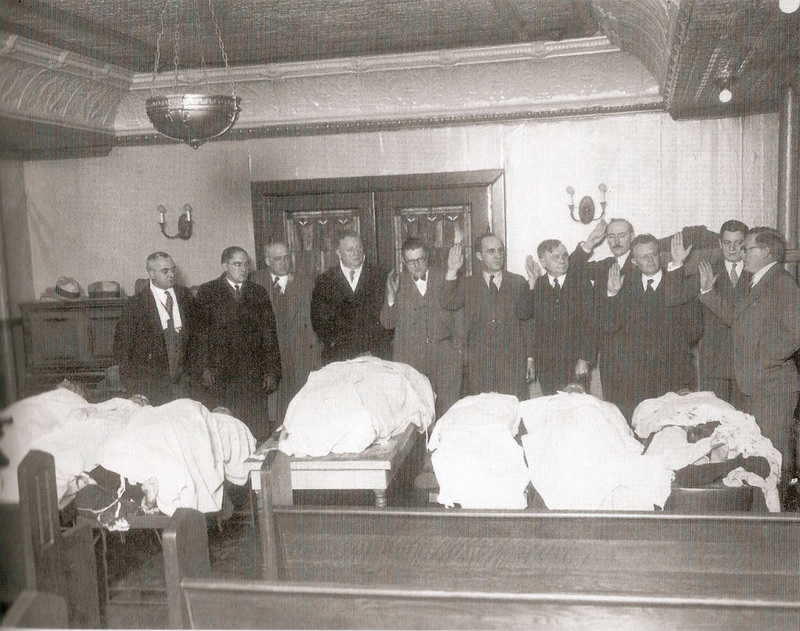 A special crime committee to investigate the shootings is sworn in at the morgue. The seven victims are seen. The massacre so outraged the public that it shed new light on gang warfare and marked the beginning of the end for the public acceptance that gangs enjoyed. Where once the public turned a blind eye to the violence - believing they only killed each other and innocent civilians were safe - it now demanded justice. The massacre also brought the belated attention of the federal government on to Capone and his criminal activities, as well as those of Moran. 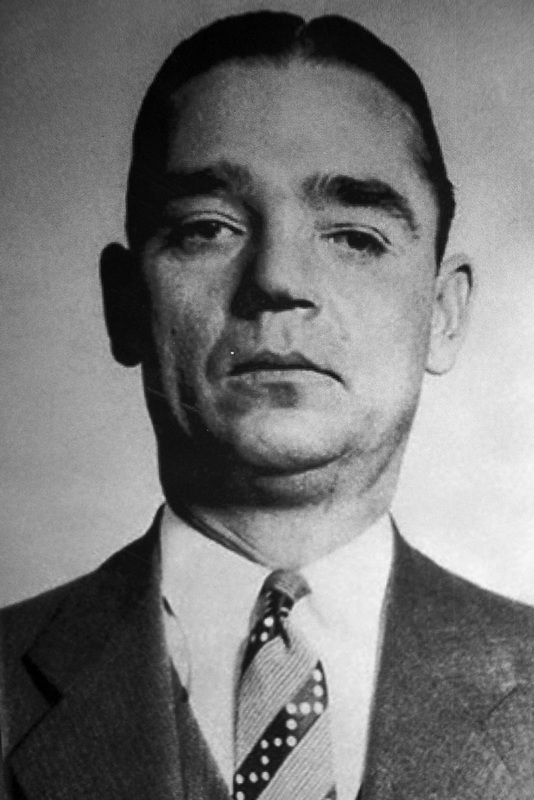 Despite the heavy blow to his operation, Moran managed to keep control of his territory until the early 1930s, when it finally passed to the Chicago Outfit under Frank Nitti, who had taken over Capone’s operations when Capone went to prison in 1931 for income tax evasion. Others didn’t fair as well either. Though McGurn would beat the massacre charges, he would be murdered on Feb. 15, 1936. The two most widely accepted theories blame either Moran, who had him killed in retaliation, or the Chicago Outfit itself under Nitti, as McGurn had become a public relations liability to the Outfit. Fred Goetz, above, and Gus Winkeler at right. At lower left is Raymond "Crank Neck" Nugent and Bob Carey. At lower right is Louis Campagna. Police stand at the window from which the lookouts watched the garage awaiting the arrival of Moran and his gang. 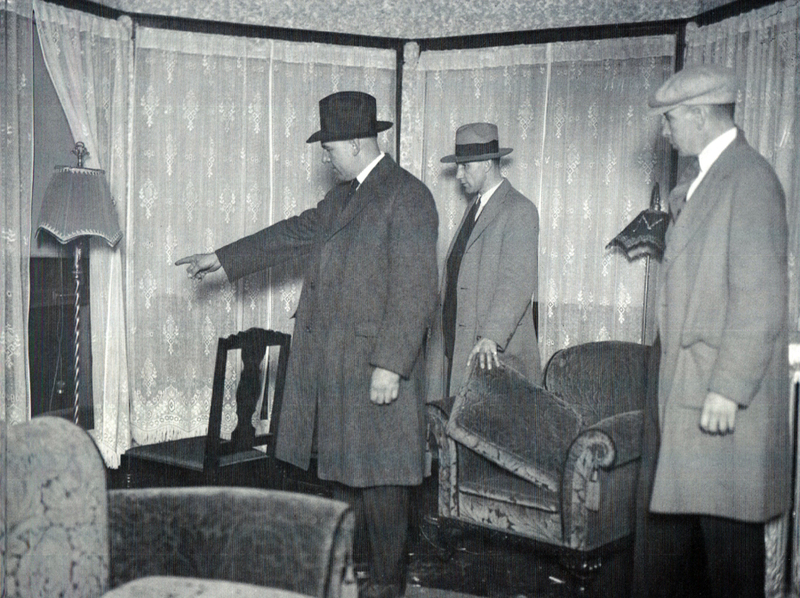 Little more major breaks would come to light about the massacre until Jan. 8, 1935, when FBI agents surrounded a Chicago apartment building at 3920 North Pine Grove, looking for the remaining members of the Barker-Karpis Gang, a bankrobbing/kidnapping gang that had terrorized the Midwest for several years. A brief shootout erupted, resulting in the death of bank robber Russell Gibson. Among those taken into custody was Byron "Monty" Bolton, an obscure criminal who proved to be a "geyser of information," as one crime historian called him. Bolton, a former Navy machine-gunner and associate of Egan's Rats, had been the valet and sidekick of a Chicago hit man named Fred Goetz (aka Shotgun George Ziegler). Bolton was privy to many of the Barker Gang's crimes and even pinpointed the Florida hideout of Ma and Freddie Barker (both of whom were killed in a shootout with the FBI a week after Bolton’s arrest.) To the agents' surprise, Bolton claimed to have taken part in the St. Valentine's Day Massacre with Goetz, Fred Burke and several others. Because the FBI had no jurisdiction in a state murder case, they attempted to keep Bolton’s revelations confidential. However, the Chicago American newspaper somehow got its hands on a second-hand version of the bank robber’s confession. The newspaper declared that the crime had been "solved," despite being stonewalled by J. Edgar Hoover, who did not want any part of the massacre case. Garbled versions of Bolton’s story went out in the national media. Pieced together, Bolton claimed that the planned murder of Moran had been plotted in "October or November" of 1928 at a Couderay, Wis., resort owned by Goetz. 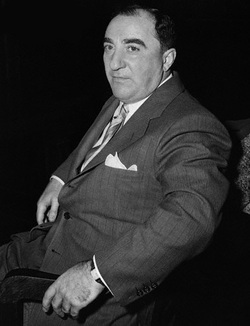 Present were Goetz, Capone, Nitti, Burke, Gus Winkeler, Louis Campagna, Daniel Serritella, William Pacelli and Bolton himself. The men stayed two or three weeks, hunting, fishing and planning the murder. Bolton claimed he and Jimmy Moran (or Morand) were charged with watching the S-M-C Cartage garage for Moran’s arrival and phoning the signal to the killers who were waiting at the Circus Cafe. Indeed, police found a letter addressed to Bolton in the lookout apartment (and possibly a vial of prescription medicine also belonging to Bolton). Bolton guessed that the actual killers had been Burke, Winkeler, Goetz, Bob Carey, Raymond "Crane Neck" Nugent and Claude Maddox (four shooters and two getaway drivers). Bolton’s account of the massacre is different from the one generally told by historians, however. He claimed that he saw only "plainclothes" men exit the Cadillac and go into the garage. This indicates that a second car was used by the killers. One witness, George Brichet, claimed to have seen at least two uniformed men exiting a car in the alley and entering the garage through its rear doors. To lend weight to this, a Peerless sedan had been found near a Maywood house owned by Claude Maddox in the days after the massacre, and in one of the door pockets was an address book belonging to victim Albert Weinshank. Bolton further said it was he who had mistook one of Moran’s men to be Moran and that he immediately telephoned the signal to the Circus Cafe. When the killers (who had expected Moran and maybe two or three of his men) were unexpectedly confronted with seven men, they simply decided to kill them all. Bolton claimed that Capone was furious with him for his mistake (and the resulting police pressure) and threatened to kill him, only to be dissuaded by Goetz. His claims were later corroborated by Winkeler’s widow, Georgette, in both an official FBI statement and her memoirs, which were published in a four-part series in a true detective magazine during the winter of 1935-36. Mrs. Winkeler revealed that her husband and his friends had formed a special crew used by Capone for major jobs. Capone was said to have trusted them implicitly and nicknamed them his "American Boys." Bolton’s statements were also backed up by William Drury, a maverick Chicago detective who had stayed on the massacre case long after everyone else had given up. Further, bank robber Alvin Karpis of the Karpis-Barker Gang, later claimed to have heard secondhand from Nugent about the massacre and that the "American Boys" were paid a collective weekly salary of $2,000 plus bonuses. Karpis also claimed that Capone himself had told him while they were in Alcatraz together that Goetz had been the actual planner of the massacre. Despite Bolton’s statements, however, no action was taken by the FBI. All the men he named, with the exceptions of Burke and Maddox, were all dead by 1935. Bank robber Harvey Bailey would later complain in his 1973 autobiography that he and Burke had been drinking beer in Calumet City at the time of the massacre, and the resulting heat forced them to abandon their bank robbing ventures. Maddox was questioned fruitlessly by Chicago police. Crime historians remain divided on whether the "American Boys" committed the St. Valentine’s Day Massacre. Over the years, many mobsters in and out of Chicago, would be named as part of the Valentine's Day hit team. Two prime suspects are Cosa Nostra hit men Scalise and Anselmi. Certainly, both men were effective killers and that kind of wholesale slaughter was in keeping with their reputation. In the days after the massacre, Scalise was heard to brag, "I am the most powerful man in Chicago." However, that remark may have been made because he had recently been elevated to the position of vice president in the Unione Siciliana by its president, Joseph Guinta. Nevertheless, Scalise, Anselmi and Guinta would be found dead on a lonely road near Hammond, Ind., on May 8, 1929. Gangland lore has it that Capone had discovered that Scalise and Anselmi, with the blessing of Guinta, were planning to betray him. At the climax of a dinner party he threw in their honor, Capone produced a baseball bat and beat the trio to death. The two Thompson submachine guns (serial numbers 2347 and 7580) found in Dane’s (Burke) Michigan bungalow were personally driven to the Chicago coroner’s office by the Berrien County District Attorney. Ballistic expert Calvin Goddard tested the weapons and determined that both had been used in the massacre. One of them had also been used in the murder of Brooklyn mob boss Frankie Yale, which confirmed the New York Police Department’s long-held theory that Burke, and by extension Capone, had been responsible for Yale's death. Gun No. 2347 had been originally purchased on Nov. 12, 1924, by Les Farmer, a deputy sheriff in Marion, Ill., the seat of Williamson County. Marion and the surrounding area was overrun by the warring bootleg factions of the Shelton Brothers and Charlie Birger. Farmer was documented as having ties with Egan’s Rats, based 100 miles away in St. Louis. By the beginning of 1927 at the very latest, the weapon had wound up in Burke’s possession. It is possible he had used this same gun in Detroit’s Milaflores Massacre on March 28, 1927. Gun No. 7580 had been sold by Chicago sporting goods owner Peter von Frantzius to a Victor Thompson (also known as Frank V. Thompson) in care of the Fox Hotel of Elgin, Ill. Some time after the purchase, the machine gun wound up with James "Bozo" Shupe, a small-timer from Chicago’s West Side who had ties to various members of Capone’s organization. Both machine guns are still in the possession of the Berrien County Sheriff's Department in St. Joseph, Mich.
2122 N. Clark St. is now the parking lot of a nursing home. The garage was demolished in 1967. The bricks from the bullet-marked inside north wall were purchased by Canadian businessman George Patey in 1967. His original intention was to use them in a restaurant that he represented, but the restaurant's owner did not like the idea. Patey ended up buying the bricks himself, outbidding three or four others. (It's uncertain what he paid for them). Patey had the wall painstakingly taken apart and had each of the 414 bricks numbered, then shipped to Canada. There are different reports about what Patey did with the bricks. In 1978, Time magazine reported that Patey reassembled the wall and put it on display in a wax museum with gun-wielding gangsters shooting each other in front of it to the accompaniment of recorded bangs. The wax museum later went bankrupt. Another source, an independent newspaper in the United Kingdom, reported in February 2000 that the wall toured shopping malls and exhibitions in the United States for a couple of decades before Patey stopped exhibiting the bricks and put them into retirement. Patey opened a nightclub called the Banjo Palace in 1971. Since it had a Roaring Twenties theme, the famous bricks were installed inside the men's washroom with plexiglas placed in front of them to shield them, so that patrons could urinate and try to hit the targets painted on the Plexiglas. In a 2001 interview with an Argentinian journalist, Patey said, "I had the most popular club in the city. People came from high society and entertainment." The bricks were later placed in storage until 1997 when Patey tried to auction them off on a website called Jet Set On The Net. The deal fell through after a hard time with the auction company. The last known substantial offer for the entire wall was made by a Las Vegas casino but Patey refused the $175,000 offer. In 1999, Patey tried to sell them brick by brick on his own website and sold about a hundred to gangsterbuffs. These came with signed certificates by Patey, who died Dec. 26, 2004. The remaining bricks of his massacre wall was given as an inheritance to his niece. She ended up selling them to the recently opened Las Vegas mob museum. While the wall is no longer complete because of Patey selling a few dozen from it, it still remains the original massacre wall in which the seven men were lined up against and killed. George Patey with his bricks.